DIY Nerf Lancer | OhGizmo! By Chris Scott Barr on 11/21/08 • Leave a comment! Man, I remember some of my favorite toys as a kid being made by Nerf. No, I’m not talking about their footballs and stuff. My brother and I had all sorts of guns and weapons that we used on each other all the time. I recall one of my favorites being a belt-fed chain gun that could fire off something like 5 rounds per second. That thing was awesome. But as far as looks go, nothing can top this excellent Nerf Lancer. If you’ve ever spent any time playing Gears of War, you’ll understand why this hunk of plastic is so cool. Unfortunately you aren’t going to find this sitting on any store shelves, as it is a custom piece. Luckily its creator was kind enough to document every step they took, complete with picture. 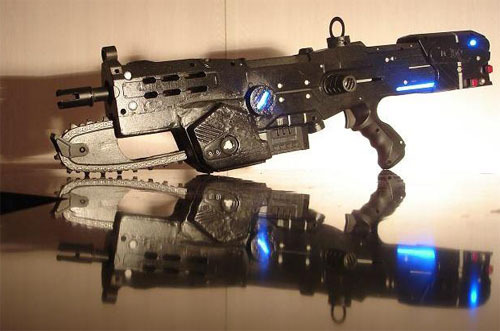 So if you’re looking to make your own Nerf Lancer, this is how its done.